Item description: Too many FFs have bent subframe front rails, caused by lifting the car to the centre of the rail with a trolley jack. Jensen Motors stated that an owner or workshop should place a piece of wood under the rail, to support it when lifting with a trolley jack. 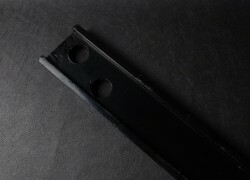 At last, we have a heavy guage steel support bar exactly for this purpose. 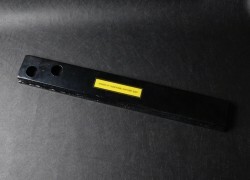 This special Jensen FF Subframe Support Bar fits along the length of the front FF subframe bottom rail (with the two holes set for the protruding bolts to the driver side). Manufactured from heavy guage steel, the Support Bar has a raised lip each side, so that the subframe rail fits directly into it. 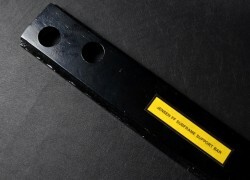 The support bar is powder coated for durability. We must stress, a car should never be left on a trolley jack alone, and this method is only to allow the front of the car to be lifted, and then supported correctly on axle stands.